After huge losses and plunging sales, experts aren't ruling out the possibility that GM, Ford or Chrysler might eventually be forced to declare bankruptcy. General Motors' product pipeline contains some interesting products that could help bolster swooning sales. 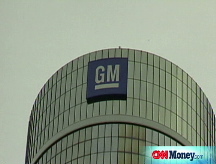 NEW YORK (CNNMoney.com) -- It's been a bumpy road for Detroit's Big Three automakers for the past few years. But it may get worse. Some experts fear that GM, Ford and Chrysler - their sales plunging as fewer consumers buy gas-guzzling pickups and SUVs - could be forced to head for bankruptcy. Last week, General Motors (GM, Fortune 500) reported a $15.5 billion second quarter net loss. While its operating loss was only $6.3 billion, that's still more than the market value of the company. GM's loss followed an $8.7 billion loss at Ford Motor (F, Fortune 500) and came on the same day that the industry reported a 13% drop in sales, its worst month in 16 years. Chrysler LLC, which was bought by private equity group Cerberus Capital a year ago and does not report financial results, relies even more heavily on sales of light trucks, such as pickups and SUVs, than do GM and Ford. Chrysler also has virtually no overseas sales to fall back upon. As such, the credit markets have expressed doubts about Chrysler's prospects, as its finance arm was recently able to raise only $24 billion of the $30 billion it sought. The company has stopped offering leases to its customers due to credit market concerns and the declining value its used vehicles. All this had led to increased speculation that there could be a bankruptcy in the next year at one or more of the Big Three automakers. Credit rating firm Standard & Poor's cut GM and Ford deeper into junk bond status last week, leaving their debt just barely above the level normally associated with firms at significant risk of near-term default. "The clock is certainly ticking," said David Cole, chairman of the Center for Automotive Research. "Obviously there's a risk. Nobody is home free." Most experts wouldn't give odds that one of them will stumble into bankruptcy, but said there is a chance they could be forced into doing so if market conditions don't improve. "We think they wouldn't choose to file. But there is a risk they could be overwhelmed by the events," said Bob Schulz, S&P's senior automotive credit analyst. Making matters worse for the Big Three is the fact that it will take years to fully adapt to the changing consumer trends - or, the shift away from gas-guzzling trucks and SUVs to smaller cars. "Fixing their product mix and cutting their staff down to manageable levels is going to take a fair amount of time to work down to the bottom line," said Bob Schnorbus, chief economist with J.D. Power & Associates. "If they continue to lose money at the current rate, their chances [of bankruptcy] are uncomfortably high." But spokespeople at all three automakers insist that bankruptcy is not on the table and said the companies have adequate cash reserves to see them through additional losses. For example, GM spokeswoman Renee Rashid-Merem pointed out steps GM took in July to raise cash, including suspending its dividend, planned asset sales and additional cost cuts. GM still has about $26 billion in cash and credit lines available to it. Ford is in the best cash position of the three, ending the second quarter with $26.6 billion in cash and $11.6 billion in available credit lines. Chrysler has $9.4 billion in unrestricted cash and securities on hand at the end of the second quarter. But GM burned through about $3.6 billion in cash in the second quarter alone. Experts say even with the large cash reserves on hand, the automakers don't have much more than a year to show significant improvement before they reach a crisis point. "GM looks like they have four or five quarters to get their act together," said Shelly Lombard, analyst for GimmeCredit, a fixed income research firm. Her most recent note on GM is titled "Being pecked to death by ducks." Even if one or more of the Big Three were to file for bankruptcy, it would likely to be under Chapter 11, which allows companies to continue operations as it tries to shed costs, rather than Chapter 7 liquidation. "They may not be running the business well. But they're still selling a lot of cars," said Lombard. "It's not buggy whips, it's a real business. I don't think any of them are going away." Instead, most industry experts say that a bankrupt Big Three automaker might shed some of their weaker brands. To that end, GM is already looking to sell its Hummer brand, for example. However, most auto experts believe a significant percentage of buyers would shy away from an automaker in bankruptcy due to concerns about getting warranty work done on their vehicle. Yet, there is a case to be made that the Big Three will eventually bounce back. In some respects, they should be in better position now than they were just a few years ago. Even as their losses started to pile up in 2005, that was due mainly to costs that were too high, not weak demand. And while the Big Three were losing market share to Asian automakers, they were maintaining strong sales on expensive pickups and SUVs, which are far more profitable than smaller cars. But less than a year ago, GM, Ford and Chrysler all won major concessions from the United Auto Workers union that will eventually allow them to significantly lower their health care and benefit-related costs. At that time, it actually appeared that all three might be getting close to a return to profitability. But before it could start seeing any of these savings, fuel prices began to soar. With that, consumers stopped buying as many trucks. This March was the first month in five years that cars outsold light trucks in the U.S. market. J.D. Power is projecting no improvement in sales until late 2009 at best. Still, the Center for Automotive Research's Cole said if the Big Three are able to hang on during this slump, there is a chance that pent-up demand in 2009 could lead to much stronger sales just as some of the labor cost savings finally start to kick in next year. "It could be a much more robust future than they've had in quite some time," said Cole. "The trick is to survive long enough to get to that future. That's where the challenge really lies."